What is Taiji Quan 太極拳 ? Taiji Quan (Tai Chi) ﻿太極拳﻿ is a Chinese internal martial art that focuses on physical and spiritual cultivation through movement. The internal martial arts are used for cultivating inner strength and harmony. At The Light Clinic, Taiji is taught with a heavy focus on proper alignment of the physical form through stances and postures. This creates the structure in which the body’s organs and tissue layers can thrive. Movement is added slowly as the physical form begins to develop. 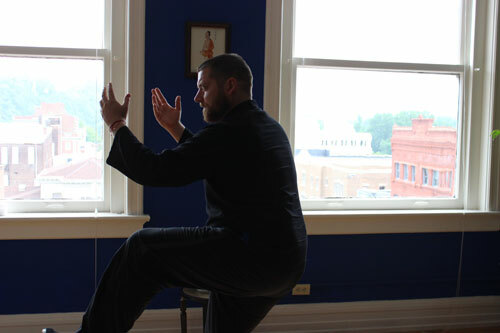 Joseph Fiala, L.Ac., MSOM has been trained in a traditional manner by Sifu Pikshan Ko (pictured left: who we were honored to host in March of 2014 and 2015 for a week-long of Taiji and Qi Gong intensives and hope to host yearly each spring). This course uses the Yang style long form as a base for instruction, though the focus remains on Taiji as a larger art and practice and is not limited to individual forms. The Taiji classes are serious training with a relaxed attitude. A healthy way to work out and transform your entire body! This ancient Chinese art is a very powerful tool to have when working toward health and longevity. A method to build core strength and vitality while tapping into your own healing power. The class is tailored to accommodate both beginner and advanced students in the same space. No previous experience necessary. 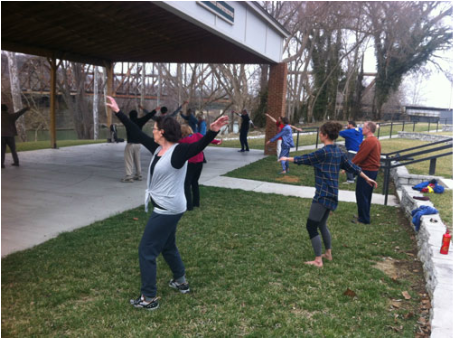 Class is typically held outdoors on the beautiful Kentucky River at Ward Oates Amphitheater in Historic Downtown Frankfort, Kentucky. We are currently meeting Mondays from 5:15pm - 6:30pm through the Spring and Summer. Contact the clinic to be notified of time changes.